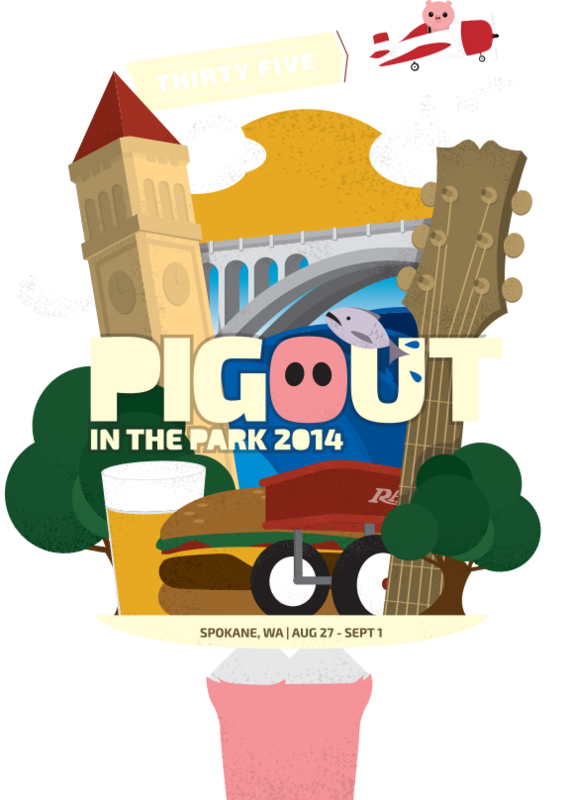 Today marks the beginning of the 35th Annual Pig Out in the Park festival, filled with 45 food booths and hundreds of bands on three stages in Riverfront Park. While the hefty lineup (seen here) can seem overwhelming at first, we've broken it down with a day-by-day guide of acts you should check out. This classic-style blues artist plays heartfelt twang with singer-songwriter intimacy. Come watch where Bartlett owners Karli and Caleb Ingersoll's passion for live music comes from, with their youthful, pop-inspired and indie-rooted band Cathedral Pearls. Close your eyes and relax along the riverside to the beauty of classical guitar. Kenney is a talented instrumentalist who may lull you into a meditative state. You won't believe these young bluegrass prodigies. With the talent of musicians double — even triple their age — these two young men have mastered their string instruments. This self-proclaimed urban rock band from Seattle fuses hip-hop and rock elements to maintain a diverse dynamic. As one of the headliners for this year's event, this rock 'n' roll/country twang band is sure to deliver a toe-tapping good time. All the way from Australia comes Hamish Anderson, playing pop-rock tunes with indie vibes. This Inlander 2014 Band to Watch charms with their four-part harmonies and female folk allure. New to the scene but quick to gain popularity, Mama Doll are something to brag about. Prepare to dance with your hips to this Latin rock group. Don't miss a chance to see these multi-Grammy award-winners play a free show. A product of the Sara Barielles generation of vocalists, Marguerite is also jazzy and smooth. Directly following Marguerite, stick around to listen to sweet-girl pop from the lovely Danielle Oliver. If you watch the TV show Nashville, you may highly anticipate seeing the Emmy award-winning actor who plays Avery Barkley's character, though Nashville novices and fans alike will love this performance. Multi-member band Flying Spiders may have lost their leader last year, but they are back and still powerful as ever. They fuse hip-hop, soul and rap in an orchestral way to create a rich and full sound. From just across the Cascades comes this new Seattle indie rock band with pop-inspired vocals. Wrap up the evening with some local, groovy ska jams. Before wrapping up your long weekend, finish strong and jam to some blues rock. The only thing better than a local six-day festival is a free festival. There's always be something new to eat (don't forget to bring cash) and a daily array of great music, so make a weekend of it.